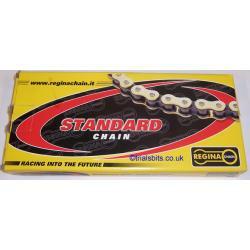 Regina Pro Gold Trials Chain 520 X 102, supplied with a split link. This should suit the majority of trials bikes with a 41 or 42 tooth rear sprocket, but if in any doubt longers chains are available. Spare split links are also available. This is supplied in a Regina Standard box, but it is a light weight trials chain with gold side plates.